The 1TB DriveStation Axis Velocity USB 3.0 External Desktop Hard Drive from Buffalo gives you the necessary space to store all of your important data. With USB 3.0 support this 7200 RPM hard drive can transfer all of your data at ultra fast speeds, enabling you to create full system backups quickly and efficiently. This Time Machine compatible drive makes backing up your Mac simple. 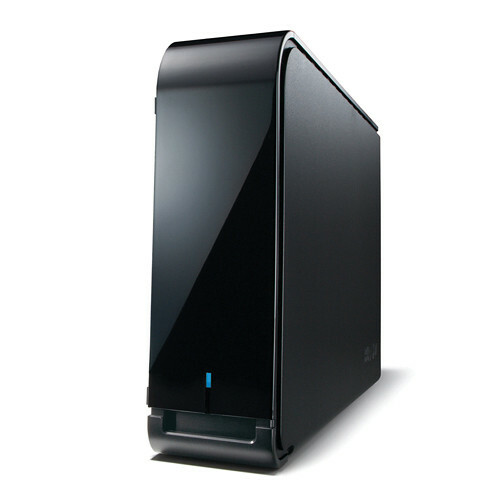 The Buffalo 1TB hard drive is also backwards compatible, making it compatible with virtually any Mac or Windows PC. This capable hard drive is not only fast but secure. You can take advantage of optional 256-bit AES hardware encryption. This quality encryption standard gives you piece of mind that your sensitive data is safe and secure. This versatile hard drive gives you a variety of setup options. You can easily integrate the drive into your desktop setup as it can be utilized as an office desktop drive, a media or game room drive, an entertainment center workhorse, or simply placed in a console cabinet. Once integrated into your setup, the fanless design will keep things quiet while it rests either upright or flat, making it easily fit into tight spaces. Equipped with a high speed 7200 RPM hard drive and USB 3.0 support, DriveStation Axis Velocity has fast file transfers and is backward compatible with USB 2.0 for use with nearly any PC or Mac. Expand the capacity of your computer for your favorite music, photos, videos and more. The simple USB 3.0/2.0 interface offers plug and play setup and universal connectivity. DriveStation Axis Velocity is perfect for backing up your important files. Disaster and hard drive failures occur unexpectedly. Schedule regular backups for your PC with Buffalo Backup Utility or use Time Machine for your Mac. Protect all of your data, down to the last byte. Optional 256-bit AES Full Disk Encryption (FDE) protects your data from unauthorized access. Simply assign a password to the hard drive at setup and your data is shielded from tampering. • Buffalo's Backup Utility is an easy-to-use and fully featured backup software for Windows PCs and can be used to back up one or multiple computers with a single Buffalo external hard drive. • ECO Manager is an energy efficiency tool used to conserve energy and reduce battery consumption by regulating the power usage of the hard drive, cutting power to the drive during extended periods of inactivity. • RAMDISK is a simple utility that allows you to create a RAM disk on your Windows PC, which creates a small but extremely fast environment to work on files in. • SecureLock software for Windows provides complete control of the data encryption on your Buffalo external hard drive, providing password protection and software data encryption. Box Dimensions (LxWxH) 9.0 x 8.7 x 3.0"
1TB DriveStation Axis Velocity USB 3.1 Gen 1 External Desktop Hard Drive is rated 5.0 out of 5 by 2. Rated 5 out of 5 by Robert from Great external drive for PC backup! This is a great external drive for total PC backup. I've had great luck with Buffalo drives in the past. I could have gone for a larger external hard drive but all I'm using it for is to do full or incremental backups of my PC. I was totally dissatisfied with Buffalo's backup program so I went to what I've been using which is a product from Acronis (Acronis True Image 2016). You need some moderate PC skills to use Acronis True Image 2016 but you can easily recover files or entire PC. My PC's hard drive is 1TB (which is only 1/5 full). I can easily backup weekly for several months before I have to delete older backups. Finally when installing the Buffalo external hard drive I decided not to password protect it. If you password protect you will have to enter password every time you wake PC up from sleep mode. Rated 5 out of 5 by Tiramisu from Excellent service and product condition I need to buy to back up my computer data and buy external hard disk. I like this is very light but solid and easy to install.Nothing to complaint about product. Service is excellent as it arrives on time. Only thing I did not like somehow the box was torn to open but not opened obviously. I took a picture just in case but inside the box product was well sealed and no suspect of opening.